In this three part series of blog posts I would like to walk you through building a highly-effective, yet extremely agile and surprisingly affordable document capture solution. Not a piece-part of a solution, rather a complete solution from start-to-finish. First, before any technology is ever considered the prudent thing to do is to clearly understand the use case for capture. In other words, think of real world scenarios and carefully consider the user experience of capturing information. The ultimate success, or failure, of the entire system can depend on whether users themselves feel comfortable with the capture experience. If the experience is not easy, available at all times or effective then regardless of how fancy the back-end technology is, they will surely resist. Imagine the user works in the sales department and receives various Price Lists often with many line items that they must enter into the company’s inventory management system. 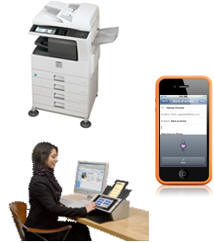 In this case a dedicated document scanner is most likely a logical choice of capture device hardware because they are frequently scanning documents. Next, consider the use case scenario of a traveling business person that needs to capture an image and details from an expense receipt. In this case using a mobile device with a camera is much more convenient and practical because they only need to capture information every-so-often and, of course, a mobile device is portable. Finally, in typical shared office environments where groups of users need to occasionally capture information from business documents then a shared network scanner or multifunction scanning device might be most appropriate. These devices have higher costs so it's not practical to put them on everyone's desk and the size is not reasonable for a desktop. After you determine the proper hardware device based on user experience the next thing you must decide on is how information will be presented to users on the hardware device. Or, in other words, the User Interface. There are several options and whether you choose to design your own application or source an existing application a decision should be made wisely. The implications are tremendous, and in particular when it comes to system maintenance and scalability. An application that is compiled and installed on a computer depending on the developers’ preference of operating system and development environment to create this application. This is typically one of a few flavors including Microsoft Windows, Apple Macintosh or Linux. This approach typically offers the most feature-rich user experience and historically been the most common method to deploy an application. Web-based is a newer, popular method for creating capture applications due to the fact that web browsers are nearly ubiquitous across the various operating systems and devices; especially mobile. 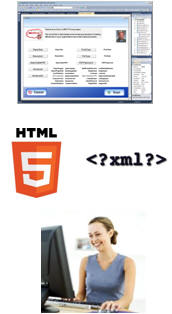 Industry accepted standards such as HTML5 and XML are quite appealing for application development. This makes supporting the widest variety of devices do-able and thus more attractive from a software development standpoint. Another emerging popular option is to build a highly-effective, and extremely functional, user interface is using a Hybrid approach. With the Hybrid user interface design this allows a developer to use both the native functions of a hardware device such as the camera on a smart phone or image processing of a scanner, yet still make the application itself open to the widest variety of devices because the application can be run in a web-browser via HTML5, for example. So, in summary, it's critically important to take the user experience into account as an important first step in creating an effective capture solution. Also, making the important decision early-on in your capture system architecture about user interface considerations will enable you to achieve the goals of providing efficient, cost effective tools with the ability to scale-up, or down, when necessary. I invite you to re-visit the introductory post in this series of posts on "Building an effective capture solution" by reading my post on "Capture Begins with Process". Or, I invite you to continue on by reading "Part 2 of 3 (Capture/Processing/Transformation)".